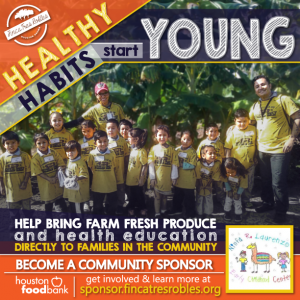 Finca Tres Robles, an urban farm located in the East End at 257 N.Greenwood, is seeking sponsors to bring farm fresh produce weekly to local families while teaching healthy cooking and eating habits to young students. The farm’s staff has partnered with the Houston Food Bank and Ninfa Laurenzo Early Childhood Center to bring this important program to families in need. Please contact Finca Tres Robles and become a sponsor today!